After a sold-out South African debut last year, Red Bull X-Fighters heads back to Pretoria on September 12, featuring the same phenomenal lineup that made history at the midsummer classic in Madrid. The 2015 season is entering its home stretch, and – with four riders still clutching a chance for the World Tour title – the fight will reach a fever pitch. 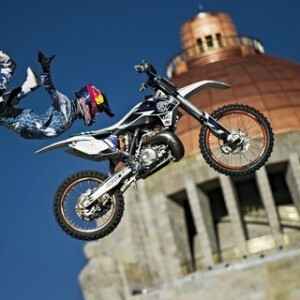 PRETORIA (South Africa) – Pretoria’s iconic statue of Nelson Mandela will oversee the action as the world’s most prestigious freestyle motocross series soars in front of the majestic Union Buildings for the second year in a row. In 2014, a capacity crowd of 22,000 thrilled to Red Bull X-Fighters South Africa, and this year spectators will have even more to cheer about: The best lineup the series has seen in its 15-year history will bring their incredible new tricks, and with only two contests left in the season, the tussle for the World Tour title will escalate to epic proportions. The competition is so tight that none of the four riders within reach of the World Tour championship can clinch it in Pretoria, and a minor mistake could put them out of the running. Having won the first two stops in 2015, Australia’s Clinton Moore tops the standings; but a third-place finish at Madrid has left him only a few points ahead of 2013 World Tour champion Tom Pagès of France, whose jaw-dropping runs in the Spanish capital earned him a historic hat trick of three consecutive wins at the Las Ventas bullring. Also in striking distance is New Zealand’s Levi Sherwood, the 2012 World Tour champion who, like Pagès, has the potential to become only the second man ever to capture two Red Bull X-Fighters World Tour titles. Rounding out this fantastic four of freestyle motocross is France’s David Rinaldo, whose career-best 2015 season has also put him in championship contention. South Africa’s 12-man field includes eight Red Bull X-Fighters event winners: Moore, Pagès and Sherwood, plus Dany Torres (ESP), Rob Adelberg (AUS), Adam Jones (USA), Taka Higashino (JPN) and reigning World Tour champion Josh Sheehan (AUS), who was crowned at the 2014 finale right in Pretoria. Statistically, Sheehan can’t claim another championship this year; but Pretoria’s vast course suits his larger-than-life riding style, and with the field’s only double-backflip he could be a spoiler to win in South Africa and shake up the standings overall. After the event in Pretoria, the 2015 Red Bull X-Fighters World Tour Championship will be decided at the season finale on October 30 at Abu Dhabi’s spectacular waterfront Corniche in the United Arab Emirates.